THE Scottish National Party protested yesterday to the BBC that a television thriller serial "Scotch on the Rocks," which starts next week could lead to "insurrection and outbreaks of violence in Scotland." Mr Gordon Wilson, vice-president of the party said: "The Scottish National Party hold the BBC responsible for the possible consequences of this reckless programme, which features gang violence for political ends." The serial, which deals with a revolutionary movement for self-government in Scotland, is based on a novel by Mr Douglas Hurd, private secretary to the Prime Minister, and Mr Andrew Osmond one of the founders of Private Eye. It is to be broadcast on the national network BBC-1 after the main news on Friday evenings. Mr Wilson said he had warned the BBC that feeling was running high in Scotland on the way the country was being defrauded over Scottish oil and steel. Any demonstrations of violence which followed the showing of the film in Scotland would be the BBC's responsibility. A spokesman for the BBC in Glasgow said he was surprised that the SNP should take such strong exception to what was essentially an entertainment programme. He added: "The baddies always get their just deserts in the end." It also seemed odd, he said, to raise objections now; the book had been published for some years and had been serialised in a Scottish newspaper. "SCOTCH ON THE ROCKS," BBC-1's new five-part thriller, has all the dash and brio of caber tossing. You do see the object of the exercise. It's just that it all seems rather heavy going. I can, however, recommend it to anyone who wants to study the art of exposition. No character is mentioned without a detailed note of his name, rank, and convictions (criminal or political). Policemen who stand up with the evident intention of sneaking off to catch the last bus are ordered to sit down again while their chief constable (he had told them he is a chief constable in case they had forgotten) instructs them in the history of Glasgow. "Did you know that Glasgow was once the second city in the Empire? The Industrial Revolution began here. Did you know that?" Cry as you may," Yes, I did know that, you interminable old windbag" or "I don't wish to know that," the exposition surges relentlessly on. "Well, if it isn't bluff Jack Hamble, star off television." Well, if it isn't it must be "John Mackie, the Clydeside rabble-rouser." The Cydeside rabble-rouser is sitting with "Sukey Dunmayne, old Dunmayne's daughter" or, as she coyly describes herself "a simple aristocratic wench far beneath your station." The dialogue in general would curl your toes. And indeed I found ten nail marks on the soles of my feet after this episode, where my toes had curled compulsively. The direction, like the dialogue, implies that we're all a bit slow on the uptake and runs on pregnant pauses, nine months long. All, all were here, the old familiar faces. It seemed that if you hung about long enough you would meet everyone you had ever seen before in any other series. Bill Simpson from "Doctor Finlay," Iain Cuthbertson from "The Borderers," and others, less familiar, who reminded me of comment of one Scot who once caught sight of Richard Baker. "It's no... it is... it's no... it is... it is wee Fattie." Scotch on the Rocks (BBC1), the Hurd and Osmond thriller about revolution in Scotland, specialises in cut-throats and Cabinet Ministers. James Mactaggart's telly version (episode one, anyway) waters down both components. It shirked showing the cop's cheek sliced off in the opening brawl; and its SNP meeting attracted 20 instead of 800. Scaled down like this, the book hardly survives. One wonders what possessed the BBC to put on this fantasy about Scottish Nationalists - a group whose historical record is predominantly decent and restrained - linking up with Glasgow street gangs and dynamiting public buildings. In the context of the Irish horrors, it seems an irresponsible and provocative gesture. OFFICIALLY, and collectively, the Scottish National Party deplores the BBC's Friday night television thrill "Scotch on the Rocks." Individually, a good many Nationalists are getting a lot of fun out of the weekly instalments, and feel it can hardly harm their image when the plot includes secret negotiations between a British Prime Minister and the chairman of the SNP. Mr Gordon Wilson, senior vice-chairman of the party, reinforced the official line of complaint yesterday in a letter to Mr Charles Curran, director-general of the BBC. He deplored the direct representation of the SNP in the script instead of using some mythical political group in Scotland as a basis for the revolutionary adventures. The Party, he said, was depicted as having elements in favour of violence for political ends and as having extreme left wing associations. The references to violence and left wing agitation were completely unfounded and were a political slur by the BBC on the Scottish National Party. Watching the third instalment of "Scotch on the Rocks" with some delegates at the annual conference of the SNP in Oban last week was a more lighthearted experience than the official line might suggest. It developed into a personality spotting context with the audience identifying characters on screen with leading lights in the party. The lady in the hat was obviously intended to be Mrs Winifred Ewing, who won the party's historic byelection at Hamilton in 1967. About the only political comment the programme produced was a criticism of the low budget decor for a scene set at the Conservative Party conference. One of the SNP leaders said, "It looks more like a hotel room than the Brighton Pavilion or the Winter Gardens at Blackpool." The BBC's Programme Complaints Commission has upheld criticism by the Scottish National Party that a television dramatization of the thriller, Scotch on the Rocks, impugned the party. The five-part adaptation of the novel by Mr Douglas Hurd, private secretary to the Prime Minister, and Mr Andrew Osmond, a founder of Private Eye, named the party and suggested it was involved in using violence for political ends. In the party's view the fiction constituted propaganda calculated to damage its electoral chances. It also suggested the party had extreme left-wing affiliations and links with extremist organizations. An adjudication by the commission, signed by Sir Edmund Compton, Lord Maybray-King and Sir Henry Fisher, said: "The use of the SNP clearly identified by name and emblem as part of the realism which the BBC thought was required to give dramatic credibility inevitably created a risk that reasonable viewers might gain the impression from the series, or from parts of it, that the real SNP was involved or was likely to be involved with the objectionable activities mentioned in the party's statement of complaint to us. "We accept that the series was conceived and executed by the BBC purely as entertainment." The commission said the first episode of Scotch on the Rocks gave the impression that the party was involved in violence and this belief was confirmed by public reaction. They recognized that the party's dissociation from violence was brought out as the drama developed but not all viewers would see all episodes. The adjudication will be published in The Listener on October 4. The Scottish National Party has scored a notable point over the BBC in having its objections to the television thriller "Scotch on the Rocks" upheld by the programmes complaints commission. 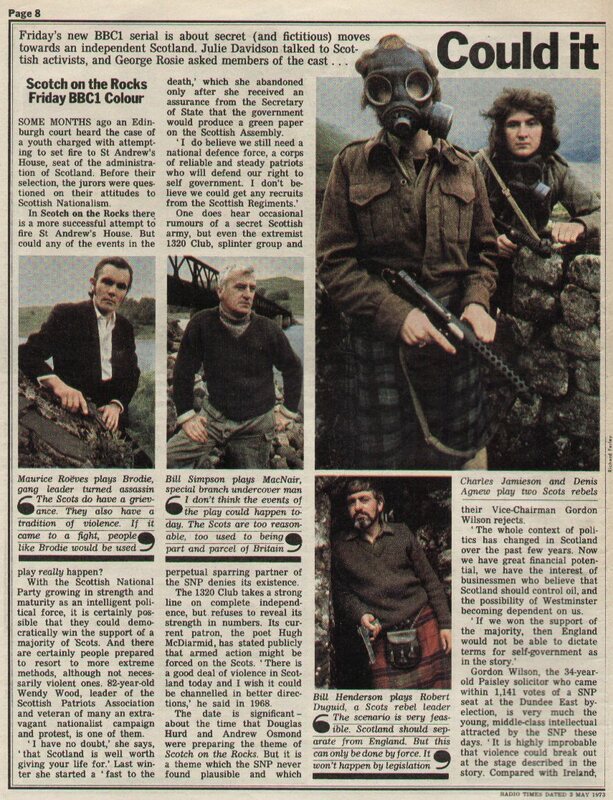 Even before the serial was broadcast on the national network of BBC-1 in May, Mr Gordon Wilson, senior vice-president of the SNP, protested that it would lead to "insurrection and outbreaks of violence in Scotland." Later, an official complaint was submitted deploring the script's association of the party with violence and left-wing agitation. 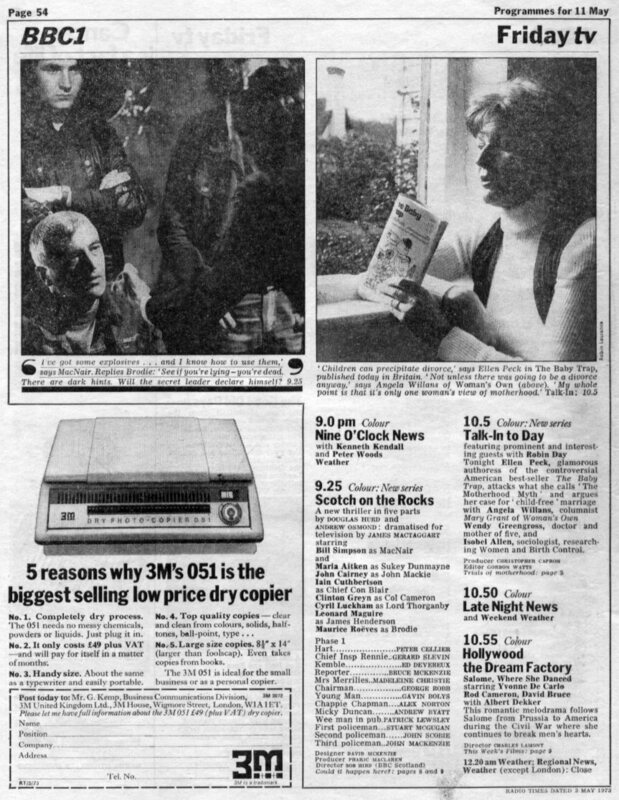 The serial was based on a novel by Mr Douglas Hurd, private secretary to the Prime Minister, and Mr Andrew Osmond, one of the founders of "Private Eye." An adjudication of the commission, led by the former Ombudsman, Sir Edmond Compton, will be published today in the Listener. The commission accepts that the serial was presented as entertainment, but found that the inclusion of the SNP, identified by name and emblem, created a risk that reasonable viewers might gain the impression that the real party was involved in objectionable activities. The report says: "We consider that the first episode of the series would leave the viewer with the impression of the SNP being involved in violence. We are confirmed in this belief by some of the reactions of members of the public, as revealed by the record of viewers' telephone calls kept by the BBC and the press after the first episode was broadcast." The commission recognised the BBC's point that the party was dissociated from violence in later episodes, but said that not all viewers would necessarily see all parts of the serial. The report says: "The scene in which the leader of the party comes very near to encouraging violence in order to assist his political ends is not found in the novel, and its presence in the script in our view seriously weakens the BBC's case."